Enter the Fool… | Only at His Feet! 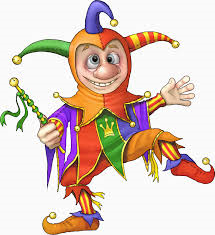 There were two definitions of the word fool that I really liked. The first was, ‘a person lacking in judgment or prudence’ and the second, ‘a retainer formerly kept in great households to provide casual entertainment and commonly dressed in motley with cap, bells, and bauble’. I think both of these definitions can describe the same person unfortunately. If we don’t reverence God, if we are not in awe of who He is then our knowledge of Him is just in our heads and not our hearts. Fools can have head knowledge of Him but never heart knowledge. For us to have a wonderful, fantastic, loving and growing relationship with Jesus it MUST be a heart thing. We must reverence the holiness of God. We must stand in awe of His majesty. A fool knows it all. A fool would not deign to desire the kind of wisdom it takes to know God. To have the wisdom of God all we have to do is ask. He said we could have it. His word is true. Nothing foolish about it! My prayer is that I am never foolish about my relationship with Jesus…that my knowledge of Him grows more everyday…that I can be a living testimony of what heart knowledge of God will do for your life. How about you?